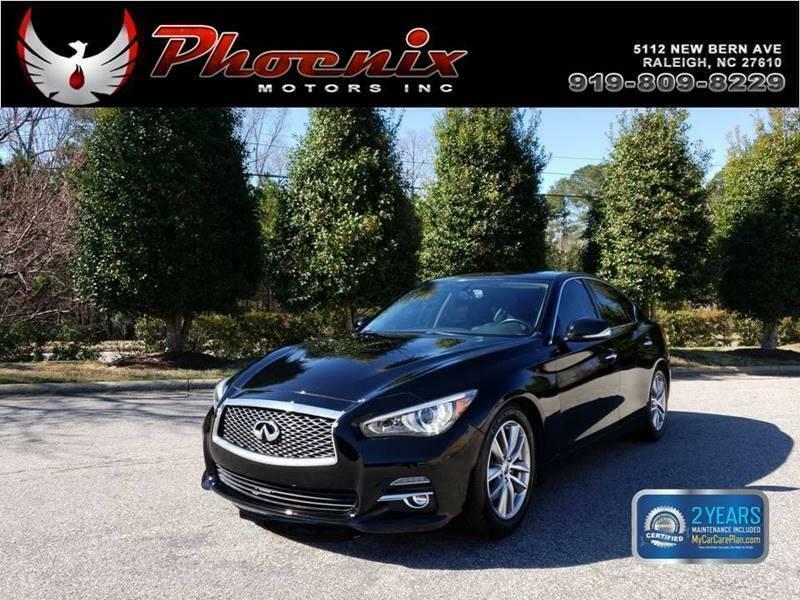 I would like to learn more about this 2014 Infiniti Q50 Premium 4dr Sedan. Please contact me as soon as possible! The 2014 Infiniti Q50 was an all-new model. It essentially supersedes the G37 sedan, bringing with it new styling and new technology features. The base Q50 comes with 17-inch alloy wheels, automatic LED headlights, LED foglights, keyless ignition/entry, cruise control, dual-zone automatic climate control, eight-way power front seats, leatherette (premium vinyl) upholstery and a tilt-and-telescoping steering wheel (heated on AWD models). Standard electronic features include Infinitis new InTouch electronics interface (with twin touchscreen displays and smartphone app integration), Bluetooth phone and audio connectivity, a rearview camera and a six-speaker sound system with a CD player, satellite radio and two iPod/USB audio interface ports. The Premium adds a sunroof, heated front seats, an auto-dimming rearview mirror, a 14-speaker Bose sound system and a multimedia monitor/display. Every Infiniti Q50 sedan comes standard with antilock brakes, stability and traction control, front side airbags and side curtain airbags.